Update – We have received an update on the situation by AMD that the Mantle update is still on track for launch in January as stated during the CES tech session. 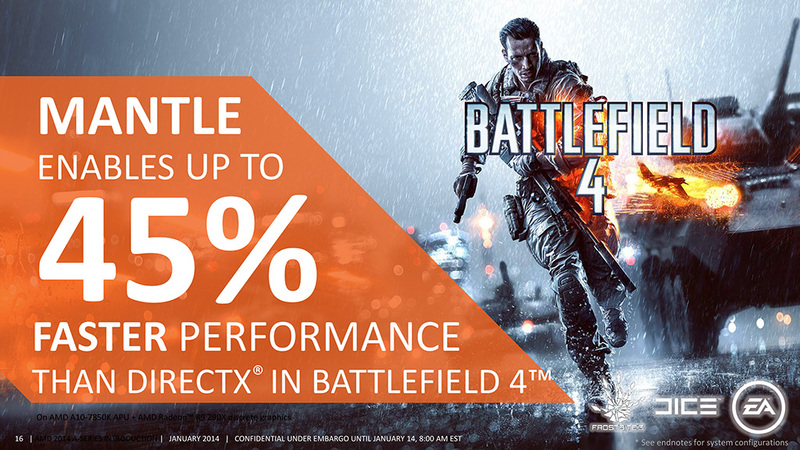 With four days left in February and the issues currently looming Battlefield 4, we will be glad should AMD actually get the update out in time. If the update in fact coming out this month, then that would be a great news for Battlefield 4 players. The AMD Mantle update for Battlefield 4 has been delayed yet again as developer DICE is focused on sorting out technical issues, gameplay and stability of the title. The Mantle update for Battlefield 4 was initially scheduled for launch in November, but was delayed to January 2014 as issues arose across all major gaming platforms including the PC. AMD Mantle Update For Battlefield 4 Delayed To February? Battlefield 4 is DICE’s flagship title and is a great game when it works but there are several issues which are yet to be addressed causing disappointment among the vast fan community DICE has amassed over years. Battlefield 4 has received several updates over the last two months on next generation and PC builds which have improved the performance of the game but the netcode itself remains optimized and causing several gameplay issues. 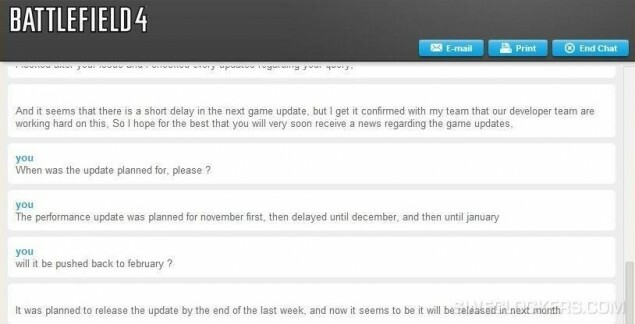 DICE has already delayed all work on extra content such as DLCs and also the highly anticipated Mantle update which was announced several months ago. A chat log with EA’s support reveals that the update has been pushed to next month. We have yet to see an actual game utilizing the Mantle API which leverages performance of AMD GCN based hardware. The AMD Mantle API is being exclusively developed for GCN enabled Radeon graphic cards. This would allow developers to dig deep into the metal to bring console-level optimizations through ease of programming and faster optimizations over a coherent GCN chip architecture. This means that we would see better performance on the entire GCN architecture enabled AMD graphic card lineup ranging from the top Radeon R9 290X to the bottom R7 240. 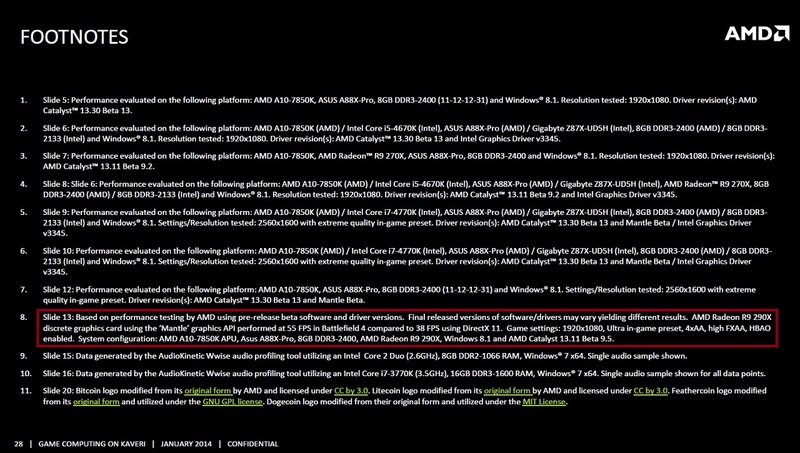 We have already seen some slides presented by AMD stating a 45% performance increase with Mantle versus the DirectX API which is definitely interesting. It should also be mentioned that Mantle also improves processor performance since very low tasks are handled by the CPU such as rendering, loading and streaming (tasked upon the GPU) so this allows perfect parallel rendering that allows utilization of upto 8 CPU cores found currently on AMD’s FX processors. This also helps avoiding potential bottlenecks for the system that may occur if the CPU is under load which in the case of Mantle won’t happen at all. So more cores finally come in handy with Mantle but like i stated, we are still a few weeks away from seeing Mantle in action. Image is courtesy of Sweclockers!